Hey!! 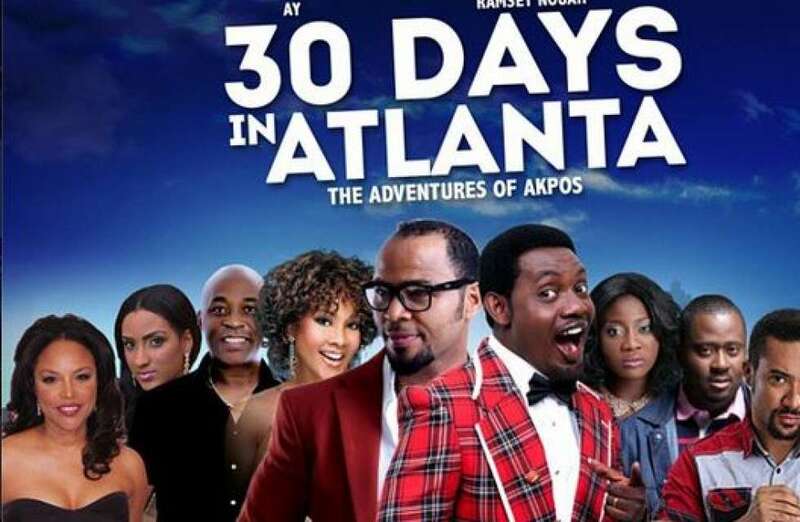 So it’s been a while since I’ve seen a Nigerian movie, but I just had to see 30 Days in Atlanta due to all the hype. Was it worth it? Keep reading…. The film begins in a crowded room where Majid Michel, the MC of an event, announced that Akpos (AY) had just won an all expenses paid trip to the United States. Akpos was allowed to bring along one other person and he chose to go with his childhood friend, Richard (Ramsey Nouah). The rest of the movie follows Akpos and Richard in Atlanta, Georgia, and documents their experiences in “obodo oyibo”. Overall the acting in this movie was good. Mercy Johnson was amazing in this movie! I loved the scene where she asked Akpos to “give himself prestige”. LOL! Vivica fox killed her role as usual; she is awesome like that. Akpos was funny and I laughed at some of his jokes. Ramsey Nouah did good; I actually think this was a great comeback movie for him. My favourite scene was definitely where Akpos’ mother visited Lagos. It was too funny!! I also loved the overall production of this movie. It was a clear movie and there weren’t too many unnecessary scenes. Perhaps I had high expectations of this movie, but I didn’t laugh as hard as I’d expected. The lady who acted as Ramsey Noah’s girlfriend in the movie is a terrible actress! I also didn’t understand Rachel Oniga’s scenes as well. I couldn’t understand her acting tbh. I feel she is losing her touch…my opinion. In addition, there were stereotypical stories of an illiterate arriving in a foreign land and misbehaving, which I didn’t really enjoy. Like when Akpos met a woman with a stubborn child, he stepped forward and warned the child that he would exchange her for recharge card if she was in Nigeria. I felt like this scene (and some others like this) were not really needed. Overall, 30 Days in Atlanta is a funny movie. I will rate it a 7.5 over 10. My rating is based on how hard I laughed (since it’s comedy) and how much I enjoyed the movie. The movie did win a lot of awards and made a lot of money in the box office (which isn’t very common for Nigerian Movies) so thumbs up to them. However, I expected a little more. I guess the movie was over hyped. Aunty u are very biased. The movie is one of the worst movies to come out from nollywood.. .. Chill let me break it down for you.. Acting.. .Ay makun was terrible he tried so hard to impress but he was blank …i stay in warri no warri boy shout like that please.. Ramsey was ok the rest characters puff rubbish…..the only funny peeps were Mercy Johnson and Ada ameh. Storyline.. …seriously error error pure error what’s that 2014 version of osuofia in London gone wrong. …….. Production just OK.. …… Rating 2.8/10 reasons Mercy and Ada.. . Nigeria award system is useless so I dnt care box office marketing strategy perfect.. .. Sorry “uncle”! No Vex. However I think you should calm down and write your comment/review in plain , simple English language with appropriate sentences , so that educated people like the ones who read this blog will understand you ! Lovely day ahead ?? Just came across dis review site recently and I must say sandra, u actually do a very neat job. The reviews are really good. And for the movie (30 days….) well I could liken it to someone who is very thirsty getting just a drop of water to drink…..it leaves much to be desired (upon all d hype). But generally its nt a bad movie but I really expected more. @efe lool..too bad. It wasn’t bad tbh. I just believe if bovi was akpors I would have loved the movie more.. The movie wasn’t too bad. It was kind of long though (about 2 hours); I found myself often glancing at my watch (but that’s probably because I was super tired too). I didn’t mind the scenes where Akpos was showing himself; it’s typically a culture shock to see some stuff happen real time vs. in the movies and all. Good review Sandra. For the first time I thought it was a really nice movie, but subsequently, think it should’ve been better in content. However, nice work by AY and a good review by you- Sandra.